Intensifying crackdowns and an increasing number of public executions, acid attacks on women’s faces, and the hanging of 26-year old Reyhaneh Jabbari for the sole reason of defending her dignity, have heightened awareness among human rights circles and the international community of the scope of crimes committed by the mullahs ruling Iran. Of course, what is published these days in the press and media outlets is just the tip of the iceberg. Public opinion remains unaware of some aspects of the crimes committed in prisons and detention facilities against dissidents –- especially women –- by the fundamentalist Iranian regime. The mullahs’ regime, stuck in a quagmire of internal and international crises, has no choice but to crack down on dissent inside Iran and take measures against opposition members abroad. Losing Nouri Al-Maliki as a strategic ally in Iraq; recent developments in Syria and the imminent downfall of Bashar Assad; the formation of an international coalition against ISIS and the fight against extremist groups, which will eventually target the Iranian regime; all have confronted the mullahs with a dead end. Therefore, stepping up repression inside the country to create a climate of fear, and carrying out terrorist attacks and laying all-out siege against its main opposition (including members of (PMOI/MEK) in Camp Liberty, through its proxies in Iraqi government) to annihilate its democratic alternative, is the objective of Iran’s mullahs to maintain their rule. Coinciding with the spread of executions inside Iran, the mullahs’ regime has through its allies and proxies in Iraq carried out many crimes against Iranian dissidents and refugees during the past few years. With Nouri Maliki assuming power as Iraq’s prime minister, and the transfer of 3,000 PMOI members in Camp Ashraf located 60 miles north of Baghdad from U.S. government control to the Iraqi government in 2009, a number of bloody attacks and an inhumane medical blockade against Iranian refugees were carried out in Camp Ashraf by Maliki under orders issued by the Iranian regime. Even following the transfer of residents to Camp Liberty near Baghdad International Airport in 2011, which under guarantees provided by the U.S. government and UN was supposed to be a secure temporary transit location for these refugees, their conditions have only changed for the worse and Iraqi forces have placed them under a comprehensive logistics-medical siege. The result of the blockade has so far been 21 individuals losing their lives and psychological torture imposed on the other patients and injured residents who survived previous bloody attacks on Ashraf and Liberty. This is apart from three missiles attacks on the camp, which have claimed the lives of 14 people and left hundreds wounded. In an unprecedented report that appeared in Iraqi-Arab press and TV networks on Monday, October 27, more than 2,000 Iraqi physicians and medical personnel signed a statement strongly condemning the inhumane medical siege imposed on the opposition PMOI stationed in Camp Liberty. The statement emphasized that the blockade against the refugees of Camp Liberty is a “blatant example of crime against humanity” and asked for its immediate removal and free access of Liberty resident to medical services. The UN and U.S. have moral and legal obligations for the protection and safety of Liberty residents, all having ‘protected persons’ status under the Fourth Geneva Convention and considered ‘people of concern’ based on numerous UNHCR statements. During the past three years, Camp Liberty has been transformed into a prison by former Iraqi PM, Nouri Al-Maliki (who was extremely dependent on Iranian support) with complete knowledge of the U.S. and UN. The Working Group on Arbitrary Detention of the UN Human Rights Council has, in its May 2012 Opinion, categorized the status of Camp Liberty residents as arbitrary detention, and General James Jones, former national security advisor to President Obama, called the camp worse than Guantanamo prison in an interview with CNN. A number of residents suffering from cancer and other terminal illnesses are being deprived of medical treatment for months now due to deliberate obstructions imposed by Iraqi security forces controlling the camp. The goal of this blockade is to break the residents’ spirit, force them to succumb to the Iranian regime, and ultimately, quit their opposition against the mullahs’ rule in Iran. Mahmoud, a resident of Camp Liberty, is seeing his bones break due to spreading cancer and he is suffering from extreme pain in this regard. However, from May 15 he has not been able to begin his treatment process. Iraqi forces have to this day cancelled his commuting to Baghdad for medical appointments six times, and prevented his commuting outside of the camp and see a doctor at a hospital. Currently there are hundreds of patients in Camp Liberty waiting in line to go out of the camp to Baghdad hospitals, and a number of whom are struggling with dangerous illnesses such as cancer. The Iraqi government has imposed a bottleneck system, only allowing four patients to go to one hospital each day. This is while patients, due to their various illnesses, are forced to see medical specialists in hospitals that have medical services and specialists for those very illnesses. Each day a number of the abovementioned patients are prevented from going to the hospital and their treatment process is postponed for months. Although during the past decade the international community has come to understand the necessity of uprooting Islamic fundamentalism to establish peace and world stability, and formed a coalition to fight it, but stopping executions and the crackdown inside Iran against opposition members of this regime is the preliminary measure needed for any strategy and planning in the war against this phenomenon. 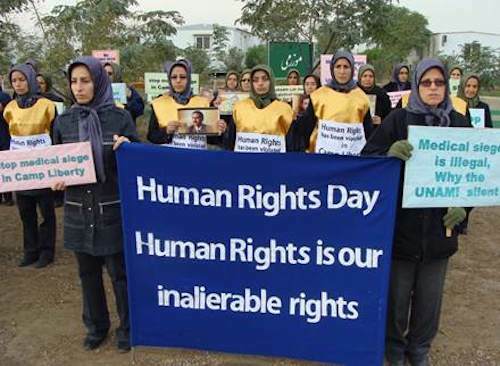 Therefore, the international community cannot remain indifferent on human rights violations in Iran and/or the Iranian dissidents in Camp Liberty. The protest and call of Iraqi physicians and medical personnel to lift the medical siege from Liberty residents is a warning to the international community to practice correct policies in the war against terrorism.